The Sector (aka compass of proportion), is a ubiquitous calculating instrument, consisting of two rulers of equal length joined by a hinge, which was in use from the end of XVI century until XIX century. Like any other invention, the Sector evolved from prior techniques and devices. Throughout the Renaissance, many attempts were made to develop a universal instrument that could be used to perform arithmetical calculation and geometric operations easily. The Sector was (as many other devices) invented, essentially simultaneously and independently, by a number of different people, though it seems the first was the Italian mathematician Fabrizio Mordente (1532-1608) about 1554. Fabrizio Mordente (see biography of Fabrizio Mordente) was born in Salerno in 1532 and studied at the Università di Napoli until 1552, when he left Italy for a 10-years trip around the world (Crete, Cyprus, Egypt, Palestine, Mesopotamia, India, Portugal, Ireland, England, France, Flanders, Germany, etc.). It seems during this trip (he mentioned year 1554), the idea of proportional compass came into his mind, most probably under the influence of Indian and Arabic mathematics. In 1567 Mordente published in Venice a single sheet treatise (Modo di trovare con l'astrolabio, o quadrante, o altro istromento, oltre gradi, intieri, i minuti, et secondi, et ognaltra particella), dedicated to Daniele Barbaro on the operation of a new compass, developed in 1554. In this first version the device was a reduction compass with a ratio 1:60 between points, which served mainly to measure each fraction of a degree with maximum precision. The purpose of this operation was to facilitate the calculation of longitude by navigators. In 1584 Mordente (with the help of his brother Gasparo) published in Antwerp another treatise (Il compasso. Con altri istromenti mathematici, ritrovati da Gasparo suo fratello), describing his device (see the nearby image) and the inventions of his brother Gasparo. 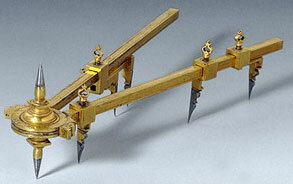 Gasparo Mordente is the inventor of the parallel ruler (instrument formed of two rulers attached to two arms along which they slide parallel to each other). In 1585 the great Giordano Bruno comes upon Fabrizio Mordente and his compass. Bruno uses Mordente's compass (which Mordente says can be used to measure the area of a circle), to prove that it can only approximate this area, and the true area cannot be known (essentially Bruno wanted to refute Aristotle's hypothesis on the incommensurability of infinitesimals, thus confirming the existence of the "minimum", which laid the basis of his own atomic theory). Bruno then writes up a series of four treatises (dialogues), where he praises Mordente's geometrical skill, but also terms him an Idiota Triumphans (Triumphant Idiot), meaning that Mordente unintentionally revealed deep truths that Mordente himself did not understand. Mordente, not unnaturally, "fell into a brutal rage" (Mordente had a reputation as a difficult and irascible man) and he bought up the edition of the dialogues with his own money, destroyed them and further he asked for support against Bruno. In 1597 the great Italian scientist Galileo Galilei developed an independent version of the Sector, that had many useful scales engraved on its legs and could be used for a variety of purposes. Later he wrote an instruction manual for the Sector and installed his instrument maker, Marcantonio Mazzoleni, in his house to produce the sector. More than 100 instruments had been produced, but it is not likely that Galileo made a lot of money from this venture, although he trained students in its use in the Accademia Delia, founded in Padua to provide mathematical instruction for young noblemen training for a military career. The device of Mordente was a proportional compass with eight points to measure the smallest fraction of a degree, using sliding cursors. Based on their positions, it was possible to establish the proportions between lines, geometric figures and solid bodies.